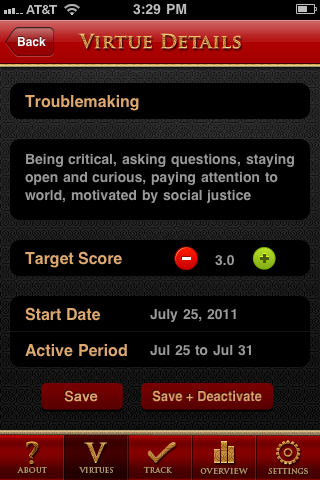 After my post yesterday about troublemaking apps, I decided to customize the Virtues app with troublemaking. So, for the next week, I am tracking my practice of troublemaking. I’m very skeptical of this approach, but thought I would try it (and maybe make trouble for it!). Check out my definition of troublemaking. Not sure if it is the best description of what I’m trying to do, but I put it together really quickly. Also, I wanted to make it short so that it would fit into a screen shot. A key part of this app is the ranking system. At the end of every day, you reflect on how well you did in practicing your chosen virtue by ranking your performance on a scale of 1 to 5. The scoring is subjective; you determine what you think your target score should be and also what counts towards achieving that score. Since they recommended not making your target score too high when you are first starting the app, I went for a 3.0. Seems arbitrary. In their about section, they advise you to “be honest with yourself” about your ranking because “only you know.” How do you know and what should you base that knowing on? “Only you know” doesn’t seem to fit with such a scientific and logical approach (with numerical ranking). Maybe there should be a box on the virtue details page where you can write in your criteria for reaching your target number? Not sure. What I do know is that this ranking system really puts me off. I’m willing to give it a chance; hopefully by the end of this week I will have figured out more why it bothers me so much and/or developed my own system for evaluating (or reflecting on…does reflection = evaluation? my own troublemaking behavior without target numbers. Here’s my first day of evaluation. Of course, I’ve already screwed it up. I forgot to “reflect” last night and had to quickly do it this morning. I gave myself a 2.5. Why? I was curious and critical yesterday, but not that much. As I began thinking through and typing out why I chose 2.5, I found myself asking lots of questions about the app, some of which are included in this screen shot. Here are the rest: When is it too much? How does this app account for excessive practice of certain virtue? Where do you establish criteria? Previous Previous post: Troublemaking? Is There an App for That?